Kofi Annan ‘61 in coversation with President Brian Rosenberg at the Leonard Center in May. Annan died in August, leaving a towering legacy at his alma mater. Photo courtesy of Macalester Communications and Marketing. On August 18, just over three months after he appeared for the final time on this campus for the renaming of the Institute of Global Citizenship (IGC) in his honor, Kofi Annan ’61, Macalester’s most famous son, died in Switzerland. He was 80 years old. Perhaps more than any other figure, the former Secretary-General of the United Nations (U.N.) and world-renowned diplomat best embodied the college’s mission and ambition: to unrelentingly pursue the causes of peace and justice, with courage and grace, on the global stage. In some ways for Macalester, he was a northern star. Beyond any collection of words, the college could simply point to Annan and say: this is who we are. Born in what is now Ghana, Annan arrived as a student in St. Paul with the benefit of a Ford Foundation grant in the fall of 1959 – nine years after then-college president Charles Turck first raised the United Nations flag beneath the U.S. flag on campus. It was a time of important growth for Macalester, which, against the backdrop of the Cold War, was recommitting itself to the liberal arts and continuing to establish itself as a proponent of internationalism amongst American colleges. Annan fit in well. Studying economics and working with the likes of Theodore Mitau and J. Huntley Dupre he was taken both with the intellectual rigor of the college and the diversity of the people he found. In addition to playing soccer for Yahya Armajani, Annan ran track and was an avid ping-pong player – regularly competing in and placing at tournaments held across campus. 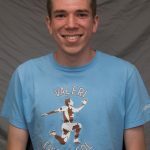 One of the biggest adjustments he made in transitioning to life at Macalester had to do with the weather. According to a 2008 college publication, Annan reportedly found earmuffs unattractive and refused to wear them during his first winter at the college – but quickly changed course. When he returned to campus in the fall, Annan continued to flourish. His final year at Macalester would see him become a state champion orator at what is now St. Catherine University, and go on to represent Minnesota at a regional oratorical contest at Northwestern University. In addition to his speaking and athletic endeavors, Annan served as president of the college’s young Cosmopolitan Club, promoting friendship between U.S. and international students, and worked as a staff member of The Mac Weekly before graduating in May of 1961. 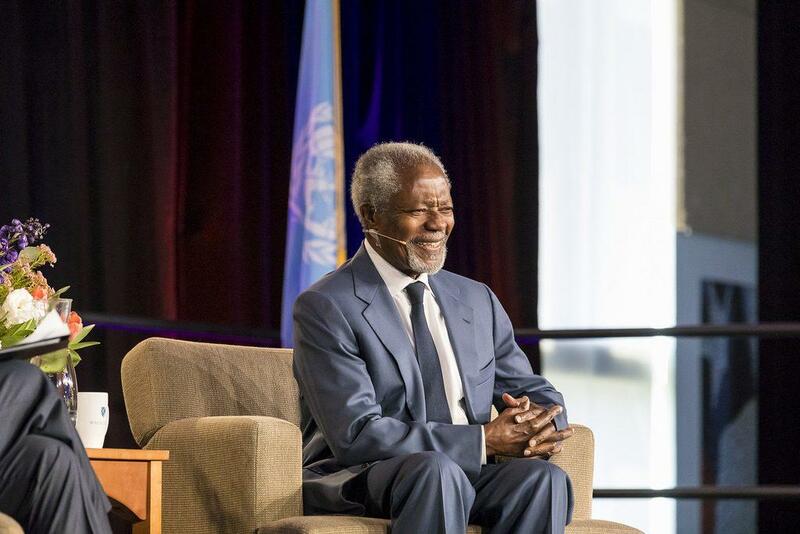 The very next year, Annan took his first job with the United Nations as a budget officer for the World Health Organization in Geneva. Though he earned a Master’s degree in management at the Massachusetts Institute of Technology a decade later, he never worked anywhere else. Over the next three decades, as Annan worked his way up to become Under-Secretary-General for Peacekeeping at the UN, he had little contact with his alma mater. 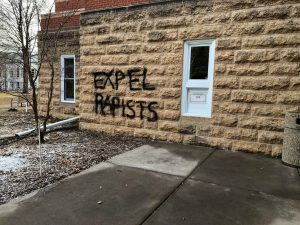 Then, suddenly, with a phone call to then-Macalester president Robert Gavin from another of the college’s most notable figures, that changed. Gavin did not. But, soon after, he gave Annan’s office a call. The two met several days later in the U.N. lunchroom, and it became immediately clear to Gavin that he was dealing with a person who was held in very high regard by those who knew him. Shortly thereafter, Gavin came back with a concrete proposal: to add Annan to the college’s Board of Trustees. It was a commitment that he expressed often. Annan’s tenure on the board coincided with the college’s hiring of professor Ahmed Samatar as its Dean of International Studies and Programming and Chair of the international studies department, and the two men talked often when Annan visited. “[He was] quite passionate about the education he had gotten here, and the impact that Macalester College had on his life,” Samatar said. “And grateful to the college for that. And [he] always wanted to bring honor to the college. On New Year’s Day, 1997, Annan became the seventh Secretary-General of the UN. He left the board of trustees at that point, but continued to return to Macalester – receiving an honorary degree and speaking at commencement in 1998 – and to keep up with one of its signature events. In 2001, for his work in revitalizing the UN around a steadfast commitment to human rights, he was awarded the Nobel Peace Prize. 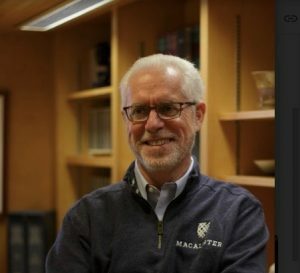 Macalester bought advertising space in The New York Times and on both National and Minnesota Public Radio to congratulate him. Around this time, there was talk of the college opening an institute committed to civic and international engagement. When Macalester appointed a new president in 2003, the project got a significant boost. “Brian Rosenberg was adamant that we should raise the funds, build the place, and get going with this,” Samatar said. That’s what the college did. The IGC opened, with Samatar serving as its inaugural dean, in 2005. “In that time, [Kofi] was always asking about how it was going, and [was] quite attached to the institute because he thought, as President Rosenberg also thought, and I thought, that the institute sooner or later will become the crystallization of Macalester’s global identity,” Samatar said. On that visit, in which the former ping-pong devotee signed a pair of paddles that will soon be displayed in the Leonard Center, it was in private moments, just as much as it was in public ones, that Annan made an impression on those who spent time with him. “Macalester people may be surprised to learn that Macalester is not the best known college in the world,” Gavin said. “But it is known around the world, because of Kofi. “His commitment to peace, his commitment to international understanding, his commitment to people, his willingness to serve – these are all things that represent the highest ideals of Macalester,” he continued.